B-1044 Ø 35 cm, hoogte 18 cm, lamp tot 100 W, bij voorkeur helder. 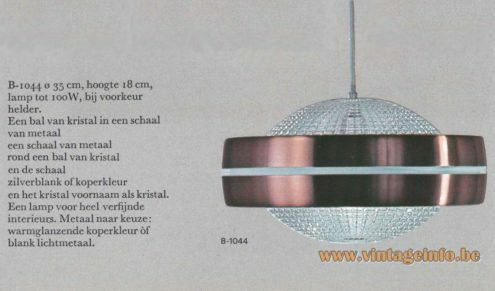 een schaal van metaal rond een bal van kristal. 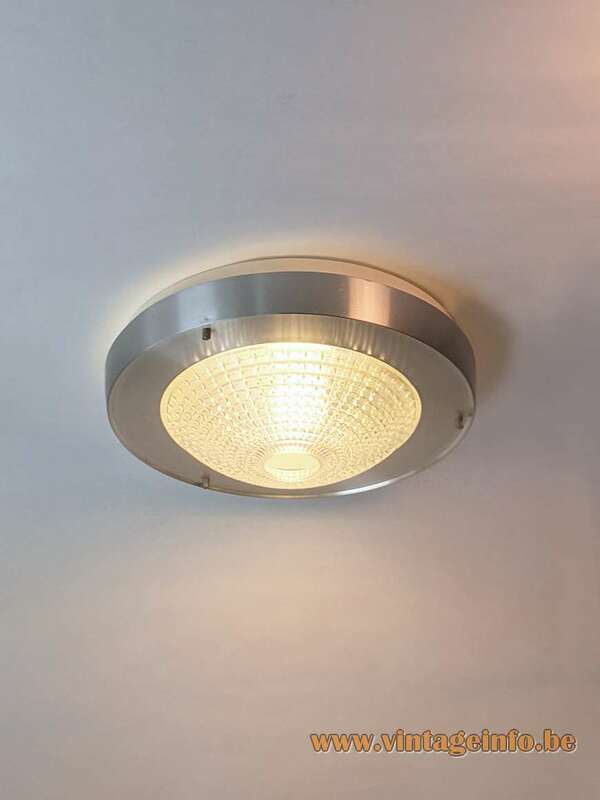 Een lamp voor heel verfijnde interieurs. Metaal naar keuze: warmglanzende koperkleur òf blank lichtmetaal. B-1044 Ø 35 cm, height 18 cm, lamp up to 100 W, preferably clear. a scale of metal around a ball of crystal. A lamp for very refined interiors. Metal of choice: warm shiny copper colour or blank light metal. Many thanks to Natascha for the beautiful pictures and enthusiasm. 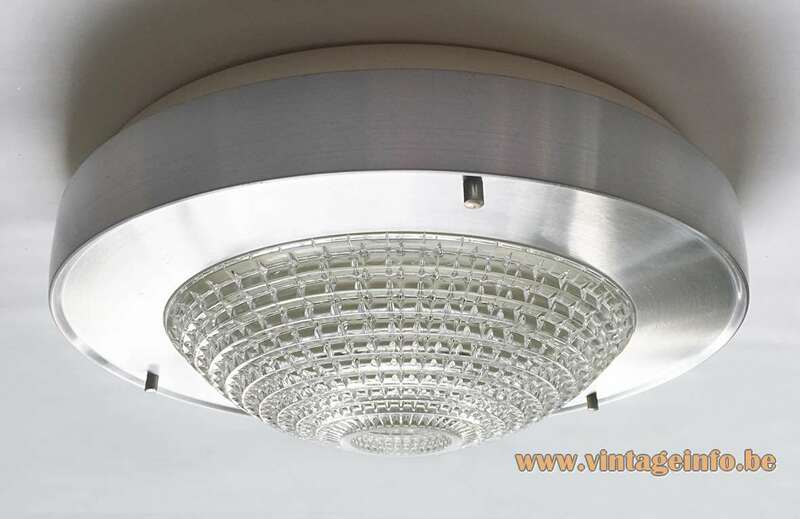 Materials: Round pressed embossed clear crystal glass diffuser. 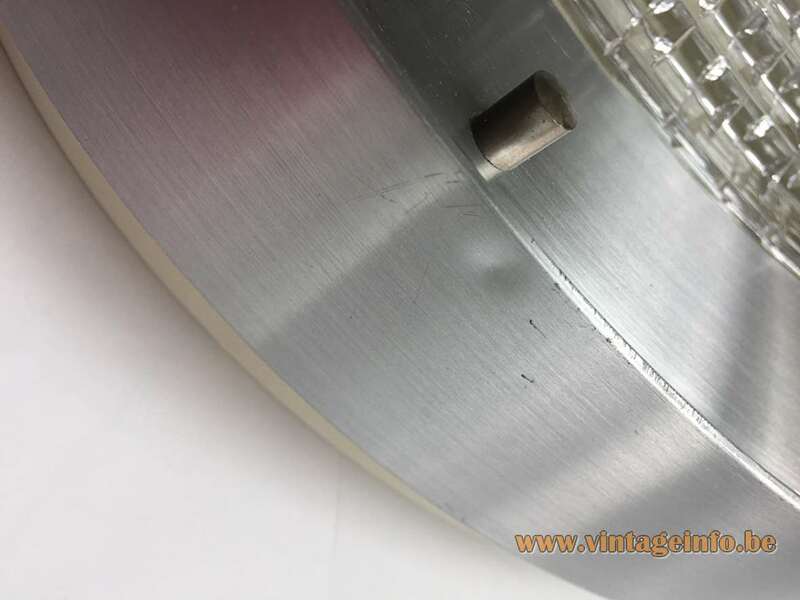 Round aluminium ring. Some metal parts. Metal socket. Any type of light bulb can be used, not a specific one preferred. 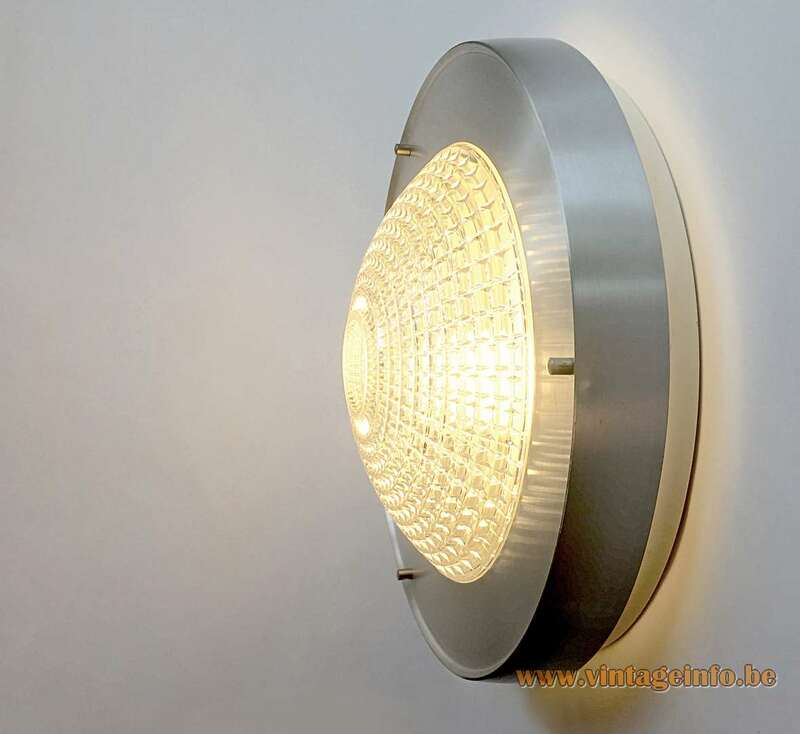 But clear light bulbs gives the best result with this type of lamps. Other versions: Also made in copper coloured aluminium. 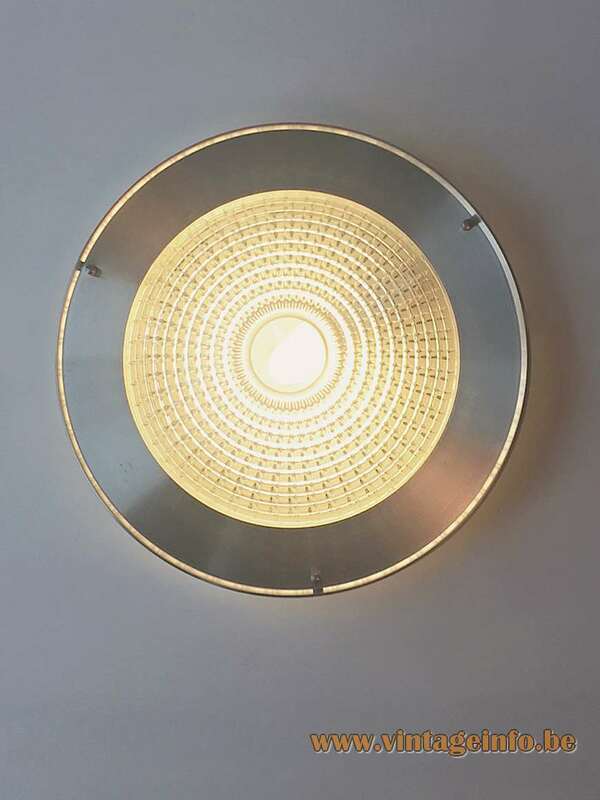 Also usable as wall lamp. These lamps were often used as wall lamps. 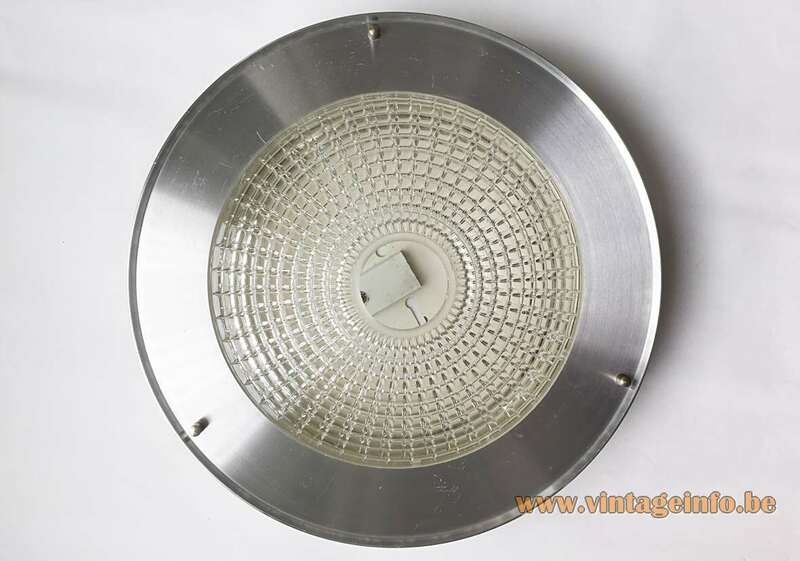 A pendant lamp (B-1044) was also made, you can find it over here. This lamp was made for a short while, it only appears in the Raak catalogue 8 from 1968. In the catalogue 9 (1972) it’s not mentioned anymore. The Dutch company Raak Lichtarchitectuur (Light architecture) was founded in 1954 by Carel O. Lockhorn (18 June 1923 – 6 October 2004), a previous employee of Philips Lighting Eindhoven. Raak, which means “to hit” in Dutch, implies design which precisely “hits the nail on the head”. 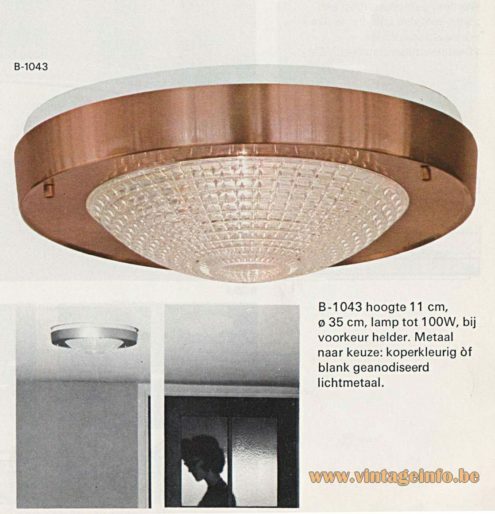 The light company collaborated with several international designers and architects, including Bertrand Balas, Evert Jelle Jelles, Frank Ligtelijn. Ger Vos, Jan Jasper Fayer, Li Helo, Maija-Liisa Komulainen. Nan Platvoet, Nanny Still-Mackinney, Nico Kooi. Sergio Asti, Tapio Wirkala, Willem van Oyen and many others. Raak also collaborated with other companies. They worked with the German Peill + Putzler for the Raak Globe lamps. Peill + Putzler produced the glass. They also sold lamps made by Peill + Putzler, such as a pendant lamp designed by Aloys Ferdinand Gangkofner. For the Raak Discus the glass was made by Bega, also a German company. 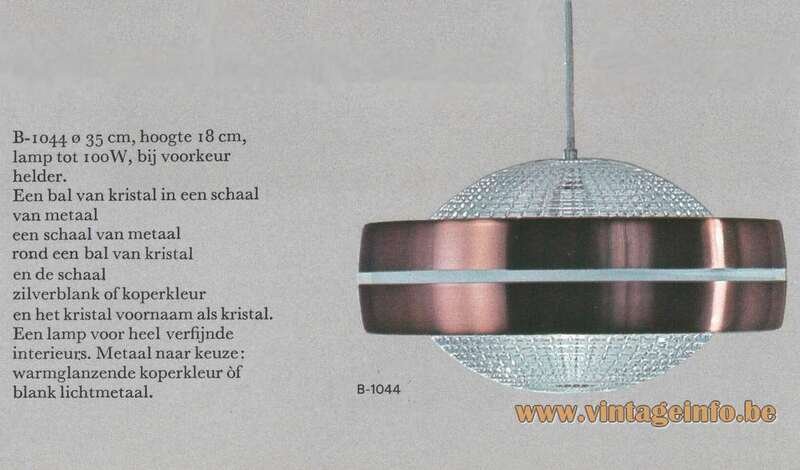 For the Night Club and Stalactites lamps a cooperation with the Belgian Val Saint Lambert was undertaken in the late 1950s. Raak also sold some lamps that were produced by Staff Leuchten (Staff & Schwarz Leuchtenwerke GMBH) from Germany. iittala from Finland produced the glass for the lamps that were designed by Tapio Wirkkala. Raak collaborated with many other producers of lighting. 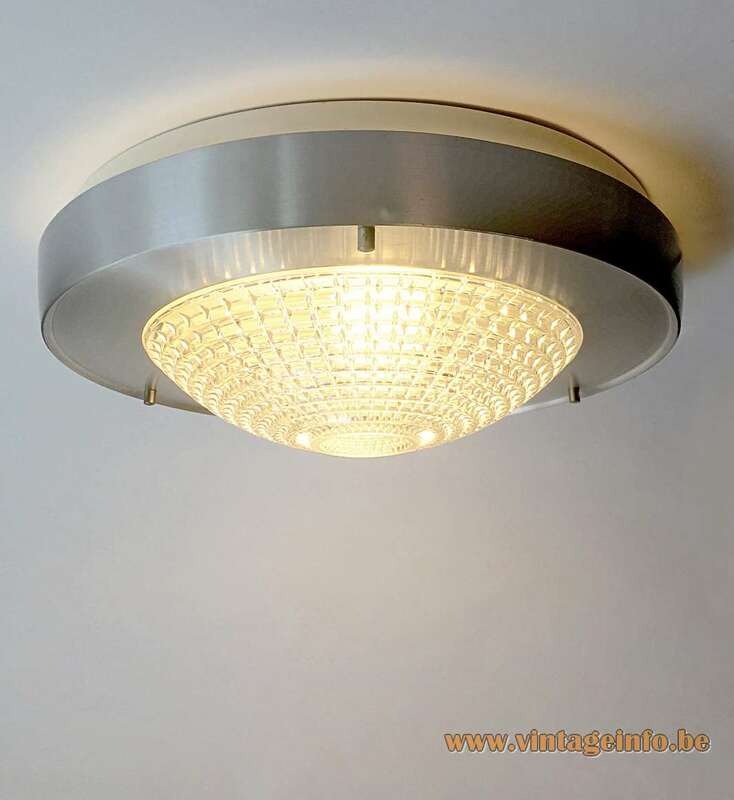 B-1043 height 11 cm, ø 35 cm, lamp up to 100 Watt, preferable clear. Metal of choice: copper coloured or blank anodized light metal.